Join the Quest for Gold in this thrilling slot machine filled with adventures from around the world. Chase the gold in the ancient Mayan temples, fetch the monkey wearing a Fez and let the Treasure Maps lead you to the fortunes by hitting 3, 4 or 5 of them and unlock the bonus feature and have a chance to increase the winning multiplier up to X 10. 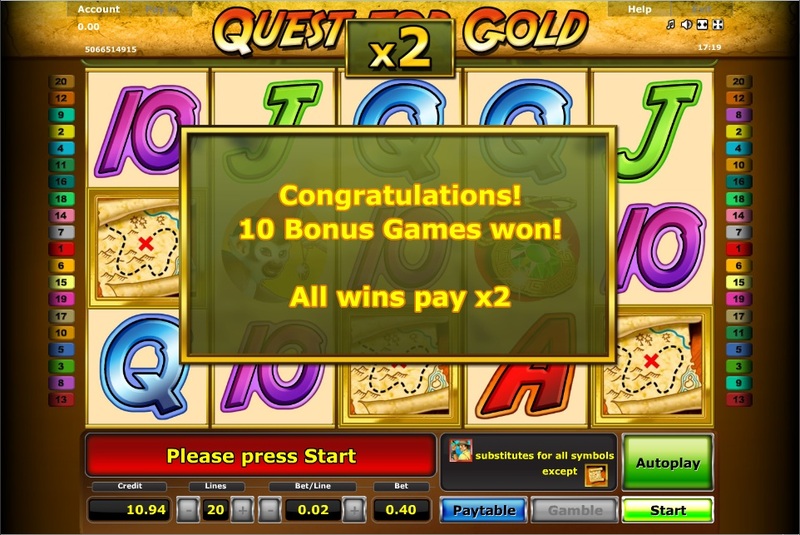 The Quest for Gold offers 20 paylines across 5 reels. This is a slot machine for adventurers! 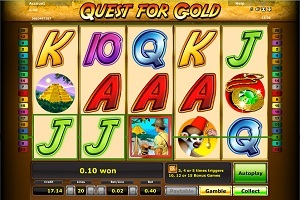 Graphics & Appearance: The Quest for Gold slot machine has a very similar theme and design as a pretty well-known movie series about an archeologist that always seems to find an exciting adventure on his expeditions. The only thing that doesn’t seem to be included in this slot is a beautiful woman as a symbol. The colouring is dominantly leather-brown and yellow with some shining gold symbols. The Quest for Gold has captured a very nice feel of the classic adventurer movies that we all love. Gamble Feature: Once you have collected a win from the spinning reels you can press the Gamble button and take a 50% chance to double your winnings. The other 50% will of course make your winnings be lost. If you’re successful in your gamble you can either collect the winnings or make another gamble. If you lose, you’re back on the reels before you know it. Game Symbols: The Adventurer symbol (the man in the hat) substitutes for all symbols except for one – the scatter symbol which in this case is the Treasure Map symbol. The map symbol will trigger the bonus feature if you manage to get your hands on 3, 4 or 5 of them. By doing this, you will get 10, 12 or 15 bonus games. Other symbols in the Quest for Gold slot include a Mayan Pyramid, a Monkey wearing a fez and a Gold Necklace with an emerald green stone in it. The 10, Jack, Queen, King and the Ace symbols are also included in this slot. Bonus Feature: During the bonus feature all your winnings are multiplied by 2. You need to hit 3, 4 or 5 Treasure Map symbols to enter this feature. You will then be awarded with 10, 12 or 15 bonus games. If this would happen during the bonus feature, you would add more bonus games and continue the bonus feature. In this case, the win-multiplier would be added by 1. This means that the winnings would be tripled instead doubled like before. The highest win-multiplier you can reach is 10. 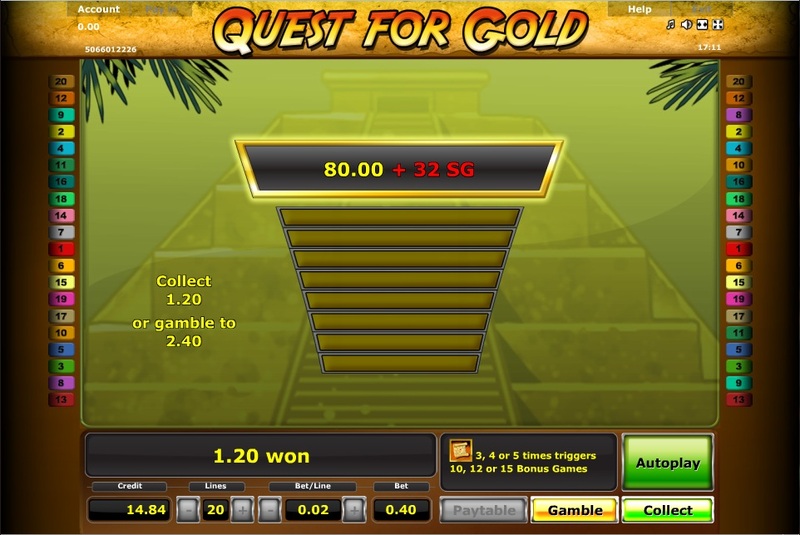 Betting Options: The Quest for Gold offers you to play on 5, 10 or 20 paylines across the 5 reels. Paylines and stake amount is controlled by using the + and – buttons in the game window, bottom center. Game Features: If you want to lean back and enjoy this adventure, you can always use the Autoplay function which means that you don’t need to initiate every spin on the reels by clicking the Start button. You activate and stop the Autoplay function by clicking on the Autoplay button which text changes to Stop once you have activate the function. « More slotmachines guides Article last updated: Monday, June 13, 2011.